The diversity of the T cell repertoire of mature T splenocytes is generated, in the thymus, by pairing of α and β variable domains of the αβ TCR and by the rearrangements of various gene segments encoding these domains. In the periphery, it results from competition between various T cell subpopulations including recent thymic migrants and long-lived T cells. Quantitative data on the actual size of the T cell repertoire are lacking. Using PCR methods and extensive sequencing, we have measured for the first time the size of the TCR-αβ repertoire of naive mouse T splenocytes. There are 5–8 × 105 different nucleotide sequences of BV chains in the whole spleen of young adult mice. We have also determined the size of the BV repertoire in a subpopulation of AV2+ T splenocytes, which allows us to provide a minimum estimate of the αβ repertoire. We find that the mouse spleen harbors about 2 × 106 clones of about 10 cells each. This figure, although orders of magnitude smaller than the maximum theoretical diversity (estimated up to 1015), is still large enough to maintain a high functional diversity. The αβ TCR is composed of two polypeptide chains with variable (AV and BV) and constant (AC and BC) domains. The variable regions are generated by the somatic recombination of V and J gene segments for AV and V, D, and J gene segments for BV (1, 2). The published three-dimensional structure of the TCR has shown that the three complementarity-determining regions (CDR)3 of each AV or BV chains form loops that interact with peptide/MHC class I complexes (3, 4). The CDR1 and 2 loops are encoded within the V genes, whereas the CDR3 results from the rearrangement of V and J segments for AV and V, D, and J for BV. CDR3s are the most variable. They are in a central position and are involved in peptide recognition. The diversity of the TCR repertoire results from rearrangements of various gene segments, their imprecise joining, addition of template-independent N nucleotides during this process, and from the pairing of different α- and β-chains (2). In addition, within the thymus, positive selection favors the emergence of a highly diverse T cell repertoire and ensures the quality control of TCRs, while negative selection eliminates self-reactive thymocytes (5, 6). Both processes involve specific interactions with self-MHC molecules (7, 8, 9, 10). It has been established that the expansion and maintenance of peripheral T lymphocytes are dependent on interactions of their TCRs with MHC molecules (11). Furthermore, appropriate self-peptides bound to MHC class II molecules are required for the persistence of CD4+ T cells in the periphery (12). Nevertheless, little is known about how the peripheral T cell repertoire is established. Given the constant influx of recent thymic migrants and the persistence of long-lived T cells, its composition is likely to be the result of competition between different subpopulations of T lymphocytes (13). The number of potentially different TCRs generated by AV and BV domain pairing and by junctional diversity has been estimated to be up to 1015 (2). The total number of T lymphocytes in a mouse is around 1 × 108, including some 2 × 107 T splenocytes. Thus, only a small fraction of the potential T cell repertoire can be used at any given time in a mouse. However, its diversity has so far not been investigated in detail at the molecular level. Using PCR methods and extensive sequencing, we report here the first direct estimate of the size of the TCR-αβ repertoire from naive T splenocytes in young adult mice. All mice used in this study were 8-wk-old DBA/2 or C57BL/6 mice raised in specific pathogen-free conditions and obtained from IFFA-Credo (l’Arbresle, France). FITC-conjugated anti-Vα2 and PE-labeled anti-TCRβ and anti-Vβ10 Abs were purchased from PharMingen (San Diego, CA); biotinylated anti-B220 was obtained from Caltag (South San Francisco, CA). Splenocytes from 8-wk-old DBA/2 male were depleted of B220+ cells using biotinylated mAbs and streptavidin beads (Dynals, Oslo, Norway). B220-negative splenocytes were incubated with FITC-labeled anti-Vα2 and PE-labeled anti-TCRβ at 4°C for 1 h and washed. Single- and double-positive cells were sorted on an Epics-Elite ESP (Coultronics, France) at the Flow Cytometry Unit (Institut Jacques Monod, Paris, France). Cell purity after sorting was analyzed by flow cytometry and was above 98% in both samples. Unfractionated splenocytes from mouse or purified AV2+ and AV2− T splenocytes were used for RNA preparation. Total RNA or poly(A)+ mRNA from splenocytes was extracted as previously described (14). Total RNAs or mRNAs were reverse-transcribed into cDNA using random primers (5 μM) for mRNA or oligo(dT) for total RNA (14, 15). PCR were conducted in 50 μl on 1/50 of the cDNA with 2 U of Taq polymerase (Goldstar; Eurogentec, Brussels, Belgium) in the supplier’s buffer. cDNA was amplified using TCR BV-specific sense primers and an antisense primer hybridizing in the BJ segment (16). Amplified products were then used as a template for an elongation reaction with fluorescent-tagged oligonucleotides (run-off reactions) as described elsewhere (16, 17). PCR were performed as above with 2 U of Taq polymerase (Goldstar; Eurogentec) or 5 U Pfu polymerase (Stratagene, La Jolla, CA) in the supplier’s buffer. PCR products were visualized by a DNA silver staining system (18) (Promega, Madison, WI). Bands corresponding to a given CDR3 length were cut from the gel and disrupted in 40 μl water. A second PCR was conducted using the same primers on 2 μl of the isolated PCR product with 2 U of Taq polymerase or 5 U Pfu polymerase for 20 cycles. Further purification was performed on a 15% nondenaturating acrylamide gel in 1× TBE buffer. PCR products were then cloned in pCR2.1 vector using the TA cloning kit or Topo TA cloning kit (Invitrogen, Carlsbad, CA). In addition, the protocol (see Fig. 1⇓) was designed to minimize PCR and cloning biases. The first round of PCR was always performed in a separate area where no amplification products are allowed. Negative controls were included in every experiment and at various steps to ensure that reagents were clean. To control the second round of PCR, empty fragments of acrylamide gel were processed in parallel to control for spurious amplifications. As previously shown, cloning of the PCR products does not introduce major biases because for each CDR3β studied, the length and the ends of the PCR fragments were identical (15). Outline of the method used to determine the size of the BV repertoire. The first step yields a profile of the fluorescent BV-BJ run-off products obtained from splenocytes. The fluorescence intensity is represented in arbitrary units as a function of the size of the DNA fragments. At this stage, we can evaluate the peak areas and determine the relative representation of each peak in this BV-BJ combination. At the second step, 40-cycle BV-BJ PCR products are separated on a sequencing gel. After silver staining, the band of interest is identified and cut out. A second PCR of 20 cycles is performed on this material, and the band with the correct CDR3 length is isolated and cloned as described in Materials and Methods. At the last step, we determine the nucleotide sequences of the plasmids present in individual bacterial clones and from them the amino acid CDR3 sequences were deduced. For sequencing purposes, PCR was conducted directly on LacZ− colonies with Taq polymerase as described (14, 15). Sequencing reactions were conducted directly on these products using M13(-20) primer and with the ABI PRISM Dye Terminator Cycle Sequencing Ready Reaction kit or the ABI PRISM Big Dye Terminator Cycle Sequencing Ready Reaction Kit (Perkin-Elmer Applied Biosystem, Foster City, CA). 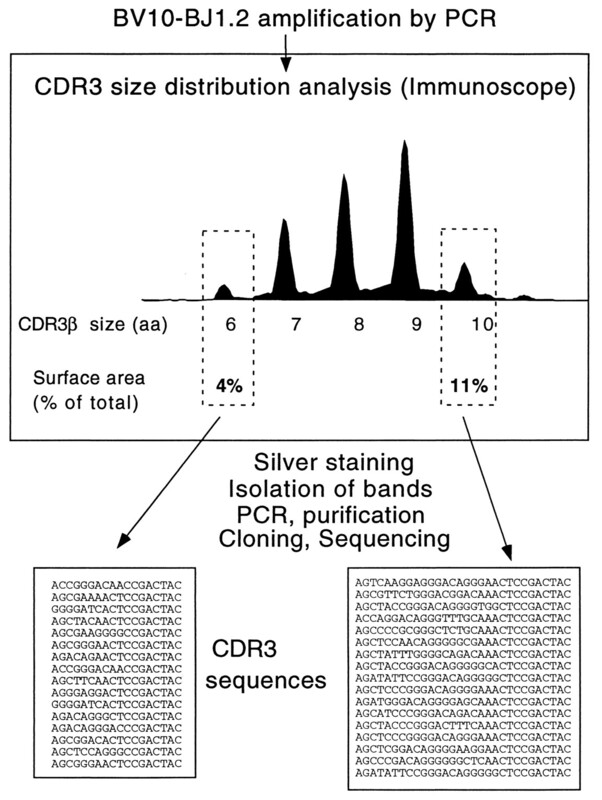 CDR3-corresponding sequences were extracted and analyzed using software designed for this purpose. The BV segment sequences were taken from Arden et al. (19) and completed for the BV1 genomic segment with the sequence of BV locus submitted by Rowen et al. in the DDBJ/EMBL/GenBank databases under accession numbers AE000663 and AE000522. in which L is the number of distinct sequences in the cDNA preparation and M is the number of observed distinct sequences among the N sequences performed. A 95% confidence interval was computed as the narrowest interval in which the cumulated values of P(L) is >0.95. In these calculations, the percentages of erroneous nucleotide sequences were subtracted from every sequence numbers. We had previously evaluated at 0.3% the rate of errors made at each position of conserved residues of the frameworks adjacent to the CDR3 (14). For the MLE values of distinct amino acid sequences, the percentages of erroneous amino acid sequences were estimated from the percentage of erroneous nucleotide sequences. Thus, for a CDR3 of 6 aa, we have 5.4% erroneous nucleotide sequences corresponding to 5.4 × 75/100 = 4.05% erroneous amino acid sequences because in average 25% of all substitutions are synonymous and the remaining ones are nonsynonymous (22). In Table II⇓, the rate of errors made at each position of conserved residues was evaluated at 0.1%. This lower error rate (0.1% instead of 0.3%), due to the use of Pfu polymerase vs Taq polymerase, was used for the calculations in Table II⇓. The size of the BV repertoire equals the number of distinct sequences found in a CDR3 peak (MLE value) divided by the product of the frequency of BV, the frequency of BJ segment, and the frequency of the CDR3 peak in the immunoscope profile of the BV-BJ rearrangements under study. The number of cells present in a CDR3 peak of given length equals the total number of T cells in the analyzed sample times the frequency of BV times the frequency of BJ segment times the frequency of the CDR3 peak in the immunoscope profile of the BV-BJ rearrangements under study. The number of cells bearing the same CDR3 sequence equals the calculated number of cells present in a CDR3 peak of given length divided by the number of distinct nucleotide sequences (MLE value) found in the CDR3 peak. The immunoscope method is a PCR-based technique that allows the measurement of the CDR3 lengths of the TCR V regions. In naive mice, it has been shown previously that the V-J profiles yield a typical bell-shaped distribution of the CDR3 lengths resolved in six or eight distinct peaks (16, 23) However, this method provides no information on the number of distinct CDR3 sequences present in a given BV-BJ rearrangement and size peak. We evaluated the diversity in a single peak as summarized in Fig. 1⇑. In a first set of experiments, we started from 7 × 106 T splenocytes and determined the number of distinct BV nucleotide sequences among the BV10-BJ1.2 rearrangement. We isolated the 10-aa-long CDR3 band from a BV10-BJ1.2 rearrangement and cloned these PCR fragments into a plasmid vector. Plasmids derived from individual bacterial clones were sequenced. In Fig. 2⇓A, the number of distinct CDR3 nucleotide sequences was plotted vs the number of determined sequences. A total of 731 sequences were determined before we reached or approached a plateau. Using the method described by Barth et al. (20) and Behlke et al. (21), we calculated the MLE of the number of distinct nucleotide sequences within the sample. It was necessary to eliminate unique nucleotide sequences generated by PCR and/or sequencing errors. We had previously evaluated at 0.3% the rate of errors made at each position of conserved residues such as Y, L, C, and A of the frameworks adjacent to CDR3 (14). This percentage was subtracted (see Materials and Methods) to obtain the MLE values displayed in Fig. 2⇓B. A, The numbers of distinct observed nucleotide CDR3 sequences are plotted vs the number of newly determined sequences. B, The MLE (•) of the number of distinct nucleotide CDR3 sequences are plotted vs the number of total sequences from which 9% of erroneous nucleotide sequences have been subtracted. The percentage of erroneous nucleotide sequences was estimated from the rate of nucleotide errors made at each position of the conserved residues. The upper (▿) and lower (▵) limit values of MLE at a 95% confidence level are shown. 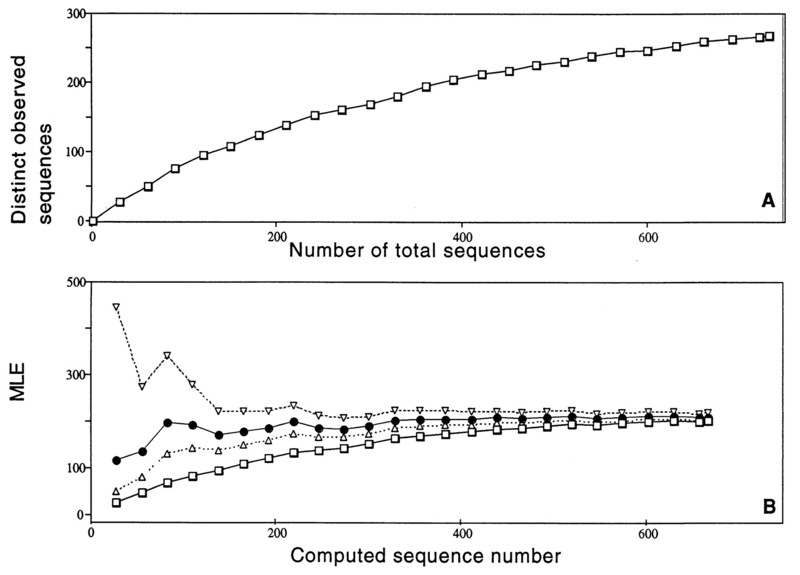 The number of distinct nucleotide sequences vs the number of determined sequences (□) are shown. Every value has been reduced by 9% to take into account the contribution of sequencing errors. The MLE value, found for 731 determined sequences, is 210 (205–218) at the 95% confidence level. Strikingly, the MLE values (corresponding to data used to draw Fig. 2⇑B) are 204 (189–223), 206 (196–219), and 207 (199–217) for 400, 500, and 600 accumulated sequences, respectively. Thus, the MLE curve reaches a plateau. This experimental result justifies the assumptions made in Materials and Methods. The data show that a fairly good estimate of the number of distinct sequences, because 96% were obtained after 370 sequences. In summary, the results show that exhaustive sequencing of cloned CDR3 sequences allows one to determine the extent of diversity in a single CDR3 peak. The above results provided a measure of the density of diversity in a given CDR3 size peak. The area of the analyzed size peak represents 11% of the total area of the BV10-BJ1.2 combination with a CDR3 length of 10 aa, and the BV10 chain is used in 7% of the splenocytes, while BJ1.2 represents 5% of the rearrangements involving the BV10 segment (24, 25) (cf footnotes of Table I⇓). We then calculate that 5.4 × 105 distinct nucleotide BV rearrangements equals 210 × 100/11 (to correct for all CDR3 size peaks) × 100/7 (to correct for all BVs) × 100/5 (to correct for all BJs) and should represent the size of the BV repertoire of naive T splenocytes. The underlying assumption that the density of diversity of the BV repertoire is independant of the BV and BJ usage as well as CDR3 length needed to be tested. In particular, the potential diversity generated by the recombination machinery might increase dramatically with the length of the CDR3 size (by 64-fold for each additional nucleotide triplet in the CDR3 region). Therefore, we analyzed a different peak from the same V-J rearrangement to determine whether the complexity within distinct CDR3 size peaks is proportional to their areas. The 6-aa-long CDR3 BV10-BJ1.2 rearrangement yielded an MLE of 84 distinct nucleotide sequences. The areas of the 6- and 10-aa peaks (4 and 11% of total) matched the numbers of distinct nucleotide sequences (84 and 210), respectively. Table I⇑ displays the calculated sizes of the BV repertoire: 6 × 105 and 5 × 105 for the 6- and 10-aa-long CDR3, respectively. To determine whether the density of diversity varied with the BV usage, we analyzed the 11-aa-long CDR3 of the BV1-BJ1.2 rearrangement. The MLE value (71 ± 3 distinct nucleotide sequences for 278 sequences), the area of the size peak (11%), and the usage of this particular BV-BJ combination (0.1%) yielded an estimated size of the BV repertoire of 4.7 × 105 (Table I⇑), in excellent agreement with the two previous estimates. Thus, the density of diversity does not depend upon BV and BJ usage, nor on CDR3 length. We conclude that the spleen of DBA/2 mice harbors in the order of 4.7–6 × 105 distinct BV chain nucleotide sequences, each being shared, on the average, by 39–45 T splenocytes. As an alternative mouse strain, we chose C57BL/6 mice that lack both the MHC class I Lb and the class II I-Eb molecules. Thus, we could ask whether their absence had any effect on the BV diversity. We analyzed the 10-aa-long BV10-BJ1.2 rearrangement, which corresponds to 11% of all rearrangements present in this combination. Among 633 sequences, we found a MLE of 125 (±2) distinct ones. As shown in Table I⇑, the size of the BV repertoire is in the order of 5.7 × 105 distinct nucleotide BV rearrangements for 8.4 × 106 T lymphocytes. Thus, the absence of two restricting elements did not affect the repertoire significantly. For the sake of completion, all CDR3 nucleotide sequences were translated into amino acid sequences, and MLE values were calculated with the appropriate corrections for erroneous amino acid sequences (cf Materials and Methods). These MLE values and the resulting estimate of diversity were about 10% lower than with nucleotide sequences (Table I⇑). This was expected because identical amino acid sequences can be generated by different nucleotide sequences. Thus, some T cell clones sharing the same BV chain generated by different nucleotide sequences originate from different precursors and are likely to be associated with different AV chains. Because, on average, the number of T lymphocytes bearing the same BV nucleotide sequence is about 39–45 per spleen (Table I⇑), the theoretical maximum αβ diversity would be (6 × 105) BVs × (39 or 45) = 2.3 or 2.7 × 107 distinct TCR αβ, assuming every BV chain is associated with a different AV. To verify this assumption and to gain insight into the combinatorial diversity generated by the α- and β-chain pairing, we isolated the AV2+ and AV2− T lymphocytes from one DBA/2 spleen and analyzed the diversity of the CDR3 sequences in BV10-BJ1.2 rearrangements within each sample. We estimated the size of the BV repertoire of AV2+ cells. Knowing the percentage of AV2+ lymphocytes in total splenocytes, we could estimate the minimal size of the αβ T cell repertoire in the spleen. B220-negative splenocytes were incubated with FITC anti-Vα2 and PE anti-TCRβ mAbs, and the AV2− cells and the double-positive lymphocytes were sorted. Total RNAs from AV2+ and AV2− cells were reverse transcribed into cDNAs. PCRs were performed with BV10 and BJ1.2 primers, and the amplified DNA fragments corresponding to the 6-aa-long CDR3 were isolated, cloned, and sequenced as above. The results are summarized in Table II⇓. Eleven of 41 distinct nucleotide sequences in the AV2+ subset were found in the 118 sequences from AV2− lymphocytes of this mouse. The fact that identical CDR3 sequences are detected in both AV2+ and AV2− lymphocytes implies that a single BV10-BJ1.2 rearrangement can associate with at least two distinct AV chains. We calculated the size of the BV repertoire using the number of distinct nucleotide sequences found in the AV2+ population (MLE = 41 ± 1). Because the frequency of AV2+ lymphocytes is 13%, the total diversity of the αβ repertoire is at least 1.85 × 106 (Table II⇑). It is worth noting that the increase in diversity brought by AV pairing is at least 2.4 because the BV repertoire size is about 7.7 × 105 (see footnotes of Table II⇑). Thus, the observed αβ diversity (1.85 × 106) appears to be 10 times lower than the theoretical value (2.3–2.7 × 107). This is most probably the result of a limited number of cell divisions after the appearance of a BV chain on a given thymocyte. This work provides the first direct evaluation of the size of the TCR cell repertoire in the mouse spleen. To deal with the β-chain, we performed extensive sequencing of immunoscope CDR3 size peaks in given BV-BJ combinations. We next evaluated the size of the TCR β-chain pool in the AV2+ subset, and finally obtained a minimal value for the αβ repertoire size. Our approach relied on two assumptions. First, the number of distinct sequences found in a BV-BJ rearrangement of a given CDR3 length had to reach a plateau that, as we showed, is best defined by an index known as MLE (Fig. 2⇑). In calculations of the MLE, we eliminated the percentage of nucleotide sequences potentially generated by errors that turned out to be close to that of unique sequences. Nevertheless, a few percent of these could correspond to T cell clones of lower abundance. Second, and most importantly, we had to demonstrate that in naive mice, the number of distinct sequences, comprised in a BV-BJ rearrangement of a given CDR3 length is directly proportional to its peak area on the immunoscope profile, irrespective of the BV, BJ usage and CDR3 length. Table I⇑ shows that, for the BV10-BJ1.2 rearrangement, there is a good agreement between the numbers of distinct nucleotide CDR3 sequences found in the 6- vs 10-aa-long CDR3 peaks, 84 for an area of 4% vs 210 for an area of 11% (84/0.04 = 2100 vs 189/0.11 = 1909), respectively. The sequences in the latter could, in principle, be many orders of magnitude more diverse (644), and it will be interesting to assess whether their diversity is limited to the same level as that of the 6-aa peak by functional selection or by the recombination machinery. We were cautious to avoid technical biases in PCR and cloning and to use naive mice bred in specific pathogen-free conditions to minimize the risk that infections would trigger oligoclonal expansions, which could hide the diversity of other BV chains. We analyzed one-third or one-half of total splenocytes to ensure an adequate representation of splenic T cell clones. We knew from Bousso et al. (15) that when the two halves of the same spleen are processed independently, 82% of the CDR3 nucleotide sequences overlap, showing that most T splenocytes are present at least twice (82% is a minimum figure because the CDR3 size peaks were not sequenced as exhaustively as done here). We find each BV rearrangement in 10–15 copies in one-third of a spleen, implying that it is present in 30–50 cells in the total spleen. Moreover, because there are 200–400 copies of BV TCR mRNA per T lymphocyte (26), we could safely work with aliquots of the RNA preparation without distorting the representation of the various TCR. It follows that figures obtained for one-third or one-half spleen do represent the entire spleen, probably with a minor underestimate due to sampling effects. Another element that may result in an underestimation of the repertoire size stems from memory T cells that were not separated from the splenocytes. However, because we carefully checked that the BV-BJ rearrangements under study gives gaussian profiles and that exhaustive sequencing were performed, the underestimate remains within the error margin of the technique. We conclude that the TCR β-chain diversity, estimated from nucleotide sequences, is in the order of 6–8 × 105, each BV sequence being shared by about 30–40 T splenocytes. The figures obtained for two different mouse strains (DBA/2 and C57BL/6) are strikingly similar, showing that the lack of two major MHC restriction elements does not affect the BV repertoire size significantly. Immunoscope profiles (14) and limited sequencing studies suggest that the TCR α-chain diversity may be similar to BV chains. However, the large number of AV and AJ segments, and the lack of information about their usage, complicate the analysis. Rather than measuring the α-chain diversity per se, we evaluated the increase in diversity that is introduced by the AV chains. We determined the size of the BV repertoire in isolated AV2+ T splenocytes. We found an increase in diversity of 2.4, yielding a size of the αβ repertoire of 1.85 × 106 (Table II⇑). This value would be underestimated if several BV chains could pair to the same AV chain. This is unlikely to occur frequently because, in thymocytes, the BV chain rearrangement is fixed before the AV chain is rearranged. The pairing of several AV chains with a given BV sequence reflects the major pathway of thymic T cell production, while the pairing of several BV chains to a given AV sequence is a matter of chance. Thus, assuming an AV diversity in the order of 105, as many as (105) AVs × (6 × 105) BVs = 6 × 1010 αβ combinations could be produced but only a small fraction actually shows up at any given time. Note that the number of T splenocytes (2 × 107) imposes a limit resulting in, at most, 30–40 AV chains per BV rearrangement. Structural constraints may prevent the emergence of a significant fraction of potential αβ combinations, but the ontogenic limitation is probably the major one. Penit et al. estimated that thymocytes with a rearranged BV chain divide six to seven times, generating 64 to 128 CD4+ CD8+ thymocytes sharing the same BV chain (27). Of these, 95% will die by neglect or as the result of negative selection (28, 29), leaving about three to seven thymocytes undergoing full maturation. The increase in diversity of 2.4 due to AV pairing, which we observed is quite consistent with this figure. If the size of the TCR repertoire of the mouse spleen is about 2 × 106, the thymocyte repertoire before negative selection, which removes about 70–80% of positively selected thymocytes (30), may be five times larger, i.e., 1 × 107. This value is many orders of magnitude smaller than the potential diversity estimated at 1015 (2). The total number of recent thymic migrants has been found to be 2 × 106 cells per day (31). The fraction that actually seeds the periphery is not known yet. Even if peripheral T cells are fully replaced by these thymic migrants and if each of these expresses a distinct TCR, it would take up to 109 days (1015 − 107 TCRs/2 × 106 cells per day) to exploit the “potential” repertoire. Thus, in any individual only a small fraction of the potential repertoire is ever used and two individuals may not share many similar sequences. When the immune and naive T cell repertoires of individual DBA/2 mice were compared, a large individual variability was found (15). Strikingly, 75% of the naive CD8+ T lymphocytes from two mice had different BV chains. When we compared the percentages of recurrent BV sequences in two different animals and for various BV-BJ combinations, the percentages of recurrent CDR3 sequences were comprised between 17% and 6% for BV10-BJ1.2 of 6- and 10-aa CDR3, respectively. These observations confirm that CDR3 sequence variability is extensive from one individual to the other. Thus, the size of the potential repertoire may be useful to allow maximal variability among individuals in a given species. Several years ago, Langman and Cohn (32) proposed the notion of “protecton,” which they defined as a functional unit of 107 B lymphocytes/ml of body fluid with a repertoire of 105 different combining sites capable of interacting with 104 Ags. They hypothesized that “in animals with more than 107 total B cells, this unit is simply repeated” (32). Our estimate of the T cell repertoire in mice is about 1–2 × 106 TCRs/2 × 107 cells, a value that is about 10–20 times larger than what was hypothesized for B cell protecton. In humans, Wagner et al. (33) found a diversity of 2 × 107 for β-chains of CD4+ blood lymphocytes. More recently, Arstila et al. (34) found a lower diversity for the β-chains of blood T lymphocytes (about 1 × 106), with a total TCR-αβ diversity of 2.5 × 107 (34). Thus, even though there are 250 times more T lymphocytes in human blood than in a mouse spleen, the total diversity in blood may be only 10–20 times higher. Therefore, the T cell diversity in humans is not increased proportionally to the total number of T lymphocytes. This is suggestive of a putative T cell protecton, envisioned as a functional unit comprising a few million T cells with distinct TCRs and not varying much in size in different species. We thank Philippe Bousso, Dr. Jean-Pierre Levraud, Dr. Jean-Pierre Cabaniols, Dr. Bernard Malissen, and Dr. Iris Motta for discussion and critical review of the manuscript. The help of Dr. Jean-Michel Claverie was greatly appreciated. We also thank Nathalie Garguier for her technical expertise. ↵1 This work was supported by grants from the European Economic Community (Biotechnologies CT 94-2005), Ligue Nationale contre le Cancer, and Association de Recherche contre le Cancer. ↵3 Abbreviations used in this paper: CDR, complementarity-determining region; MLE, maximum likelihood estimate. Pannetier, C., J.-P. Levraud, J. Even, P. Kourilsky. 1997. The Immunoscope approach for the analysis of T cell repertoires. J. R. Oksenberg, Jr, ed. The Antigen T Cell Receptor: Selected Protocols and Applications 287 Chapman & Hall, Austin, TX.